Happy Birthday Earth Day, from the Former Head of the Earth - 10 Minutes of Brilliance: Smart, Funny, Creative and FREE! The True History of Earth Day and International Earth Day. This Saturday, April 22, the Earth will be 4.543 billion years old (give or take a few eons). And Earth Day, the annual celebration honoring Mother Earth and all the humans, plants and animals who populate the 3rd planet from the Sun, will celebrate its 47th Birthday. At first, I thought it might be cool to celebrate the Earth’s Birthday this Saturday. But once we put 4 1/2 billion candles on a cake for Mother Earth, we realized what flaming idiots we were. This is not just a picture of our efforts to wish Mother Earth a Happy Birthday. It is also an apt meme for what the Earth will experience once EPA Administrator Scott Pruitt ignores science and climate change and dismantles his own agency. That’s Pruitt wearing the dunce cap. So, once cooler heads reigned, we decided it made more sense to wish Earth Day a Happy Birthday. 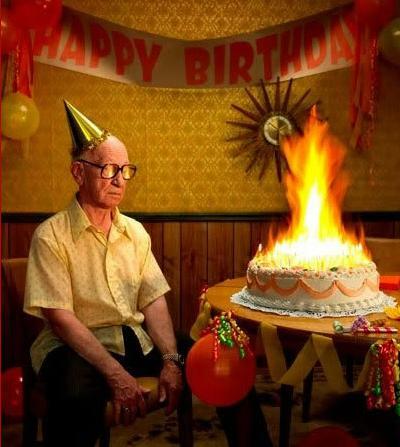 And while I hate to brag (while I’m sleeping, anyway), there was no more appropriate person to authenticate that Happy Birthday wish to Earth Day participants than I. After all, I was once the Head of the Earth, I launched International Earth Day, and I can prove it! “What?” you say. “That’s impossible!” You doubt there ever was a Head of the Earth! Well, it’s true. As longtime Readers of my blog will attest, every year I explain how I was actually the Head of the Earth in 1972. I’m not claiming to have originated Earth Day. The initial celebration of the environment and planet Earth began in 1970, two years before I launched International Earth Day. The idea for a national day to focus on the environment came to Earth Day founder Gaylord Nelson, then a U.S. Senator from Wisconsin, after witnessing the ravages of the 1969 massive oil spill in Santa Barbara, California. Inspired by the student anti-war movement, he realized that if he could infuse that energy with an emerging public consciousness about air and water pollution, it would force environmental protection onto the national political agenda. So on April 22, 1970, he launched Earth Day. STAN: Did you see that? STAN: That entire last paragraph, the one right above us. Goldman, the blogger, stole it from Wikipedia. 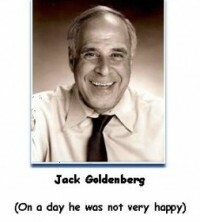 HARRIET: First of all Stan, the originator of this blog’s name is Goldenberg, Jack Goldenberg. HARRIET: And Jack didn’t steal it from Wikipedia. He “borrowed” it from a different web site, The History of Earth Day. And there’s no harm in that. After all, Jack is a Copy-Writer! HARRIET: But look, Stan, I’ve warned you time and again not to say terrible things about Jack. After all, you’re imaginary and Jack writes everything you say. Let him continue. Or he’s liable to kick us both off the blog. Then, the only place that’ll hire us will be The O’Reilley Factor on Fox News. STAN: Didn’t they just just shut down? HARRIET: Now you’re catching on! Sorry, Readers. Where was I? 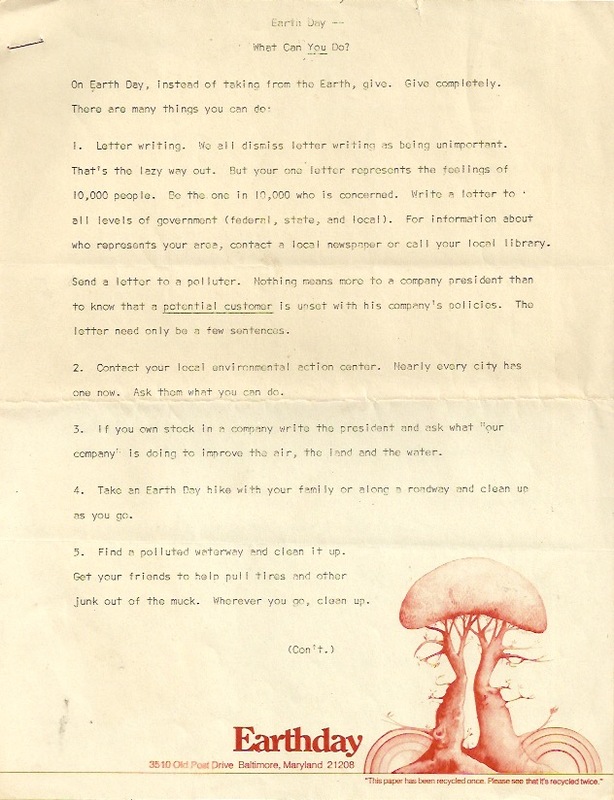 Oh yeah, by 1972, two years after the original Earth Day, interest in helping the environment started to wain. So I had business cards printed that gave me the title, Head of the Earth, and I launched International Earth Day. Wait, I see one of my Readers has his hand raised. Yes? GEN Z READER #1: Question. What’s a business card? ME: It’s a card that announces to a person you meet, your name, title, company, and other contact information. GEN Z READER #2: So it announces that stuff electronically? ME: Oh, no. On paper. GEN Z READER #3: What’s paper? ME: Thin slices of non-digital material manufactured from the pulp of wood or other fibrous substances. I looked around the blog to see if anyone else had any more questions. But by then, everyone’s heads were buried back in their smart phones. (Not bad, I thought to myself. I had their attention for almost 3 seconds.) Then I saw one of my Readers reluctantly raise his hand. BABY BOOMER: I have a question, too. ME: Did you want to know what Gen Z is? BABY BOOMER: No, I wanted to know what time dinner is and where’s the men’s room? ME: Sorry, there are no rest rooms on blogs. As I was saying, by 1972 many people were already getting tired of hearing about the environment. But I figured we still had a lot to do to tidy up the planet. So, I did the only thing a sane, sensible and caring person would do. I appointed myself Head of the Earth and announced my title and the launch of International Earth Day to the press. You might question who gave me the authority to become Head of the Earth. Well, the position was open. And there were no other applicants. Besides, I was young and figured it would look great on my resume. Next I carefully studied the field to learn all I could about the Earth, endangered species, plant life, pollution, green marketing, carbon cycles, population control, water and energy conservation, recycling and the myriad efforts needed to Save Our Planet. An hour later, I started to work on business cards and stationery for my new company, Earthday. Here is my Earthday stationary. I used it to tell the media and the world what they could do to save planet Earth. Notice the logo in the right hand corner. Can you spot the faces in the trees? I got radio stations across the country to tell listeners “The 100 Things You Can Do to Save Planet Earth.” I convinced governors to announce Earth Day proclamations, citizen groups to hold Earth Day Awareness Rallies and I even got The Today Show to interview an expert on the continued importance of the environment. “Yes, how can I help you?” I said. “I understand you’re running an environmental campaign for the planet and that you’re the Head of the Earth,” he said. I can understand why you might not believe this actually happened. But I still have the permission letter from the U.N. to prove it. In the entire history of the United Nations, there was only one person there with a sense of humor. Somehow, he got UN to support me. The U.N. gave me their full support. 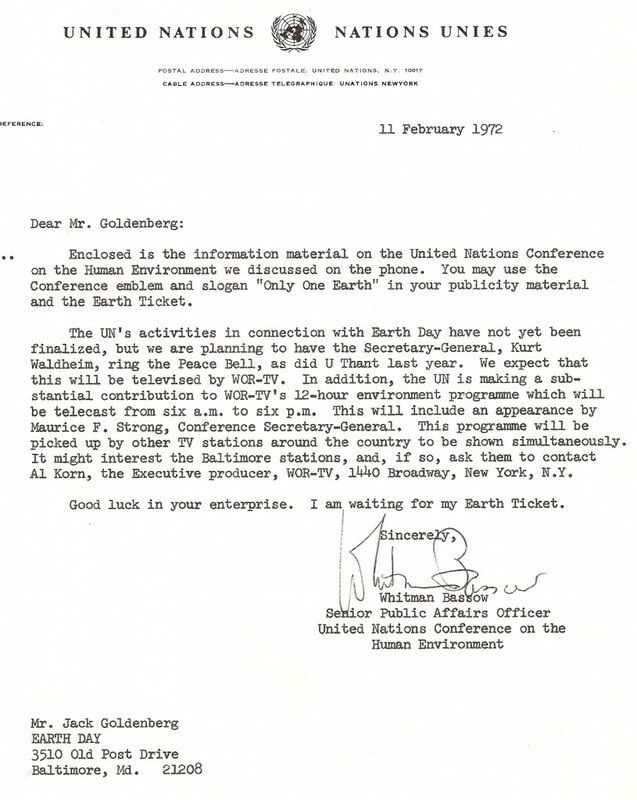 They gave me permission to use the U.N. name, logo and slogan from their “Only One Earth” Conference on my “Tickets of Admission to the Earth.” I wanted to charge people for coming to the Earth on Earth Day. A dollar for adults. 50¢ for children 12 and under. As I saw it, while it wasn’t mandatory to have an Earth Ticket to show up on Earth on April 22, 1972, but it sure would be a nice gesture. And a cool way to donate to important environmental causes like Friends of the Earth. Friends of the Animals and The Wilderness Society. Was my campaign for International Earth Day successful? Well, yes and no. The Earth is still here and the once-a-year fervor to care for Mother Earth has been institutionalized, commercialized and co-opted by big business all over the world. And that’s a good thing. But it’s a shame the Environmental Protect Agency is doing all it can to ignore planet Earth and accelerate climate change, rather than offering an all-important defense against it. Still, activists all of the world will celebrate Earth Day tomorrow on Saturday, April 22, not because of what I did, but because of what Gaylord Nelson did when he launched the original Earth Day. Follow the 6 R’s on Earth Day and Every Day: Reduce, Recycle. Restore. Reduce. Replenish. And #Resist. As the former Head of the Earth, the least I can do is bring the Happy Birthday Earth Day cake. 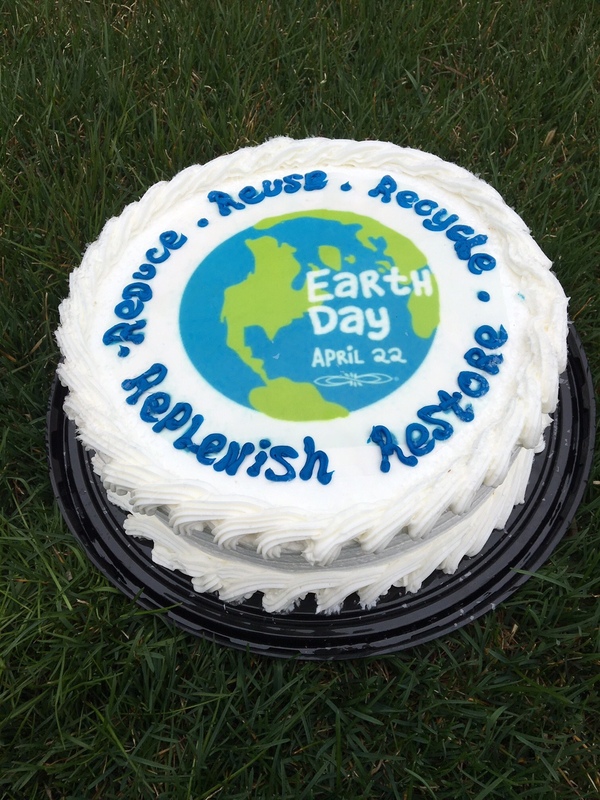 The Happy Birthday Earth Day cake is a reminder to protagonists and Earth lovers everywhere to Follow the 6 “R’s”: Reduce. Recycle. Reuse. Restore. And Replenish. Five of the 6 R’s are on the cake. I’ll add the 6th R, #Resist, and remind the US Government and the EPA that where the Earth is concerned, “You can’t have your cake and eat it, too!” After all, the Earth is a mother. And so is Scott Pruitt, just not in the same way. A few years later, I wanted to proclaim myself “Master of the Universe.” But some damn toy company beat me to it. That’s my story and I’m sticking to it. If you enjoyed today’s blog, learned something, laughed a little and are motivated to do something, anything for planet Earth, I hope you’ll sign up to receive my sometimes monthly blogs (see the top right on the blog’s Home Page) Next time, we’ll be blogging about the single best place to visit this summer, how to buy a new TV and any other brilliant ideas or stories that come to mind.